Xerox three panel covers. This version has a different cover featuring an angel and a lake of fire. Studio tapes with stickers on the shell. Lyrics on back. Labeled as a demo but the band states it was an EP, but the demo thing stuck. 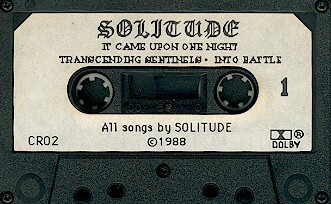 This would be re-released under their new name of Solitude Aeturnus.